DAVID-Laserscanner Forum • View topic - Canon EOS 40D?? Does anyone know whether the Canon EOS 40D camera works with David software? I am looking for a replacement for my logitech 9000 Pro and the David Cam is too expensive for me at the moment. So I thought a used 40D could be a useful alternative. It has live view and therefore should work? I read a lot in this forum but am still not sure which camera and projector to buy. At the moment I have a borrowed Optoma EX612 but don't know if this model is really good for SLS. The Canon EOS 40d has "only" 1024x680 pixels in live view mode. To get the full performance of your DSLR you should use it with image grabber and "Lets scan" SW which you can find in this forum. 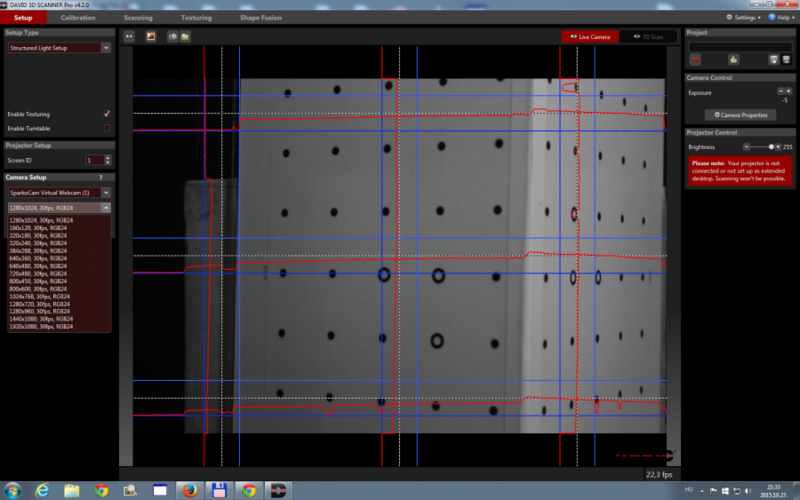 Anyhow live view is much easier and faster for SLS scanning. The drawback of using DSLR in live mode are: limited resolution in live mode, heavy weight with difficulty to mobile construction for dslr and projector, external power supply urgently recommended. I have started with Canon EOS 600d in live view which quite good results. Anyhow due to the problems mentioned above i bought david-cam-3.1-m and the result/handling is much better than my EOS 600d. The david cam is worth the money !!!!! 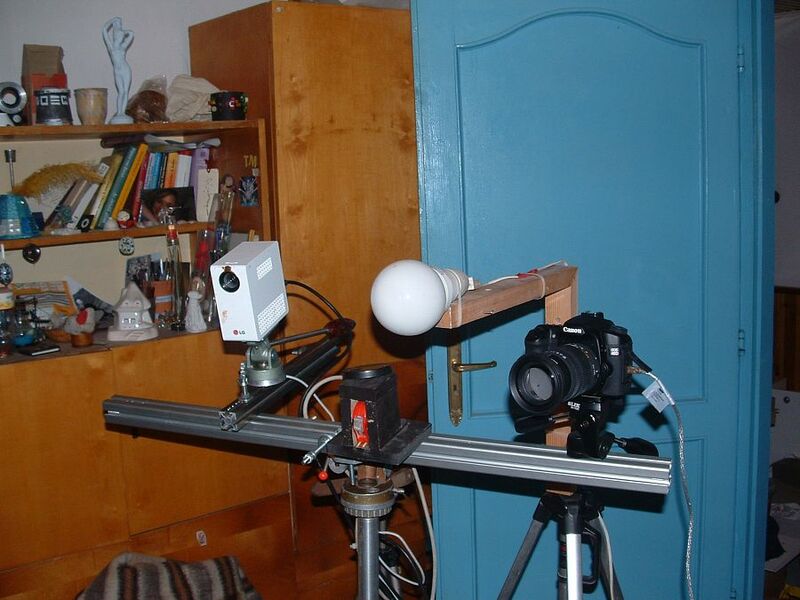 Another good idea - if you do not want to spent too much money for industrial cam - is to modify webcam with lens. Based on feedback here in this forum the quality improvement seems to be really good. As projector i am using standard Acer K135i projector which is quite similar to the David SLS-2 projector which is a modified K132. I personally would recommend to spent the money for industrial camera with good lens. I would say the david cam is really good value for the money. I am sure that the David cam is a good one. And I don't think it's just because of the 20% more resolution. Would you show me one of your results with Canon and David cam so I can compare them? I don't know the quality of the David Cam. Posting some screenshots would be very interesting. Unfortunately, it's not always possible to know on the forum what scan was made with what equipment. I have tested three projectors because I was having surface artifacts with the Acer K135 (waves). The combination Acer K132 (or 135) with the David cam is probably a very good match. My results with a Canon 60D were not completely satisfactory. I am hoping to test this setup with a 4k camera. By searching the forum, you will find also many other great scans. If you are going to use a Canon, these are the live resolution of most models. Today I took my Canon D40 Sparkocam pair, this is the live view. Thank you for your advices, @Curiousjeff! I've already read most of those threads during the last days. A lot of things to consider... The most promising approach for Canon EOS seems to be LetsScan. But even Narmella can't tell if the 40D will work with it. I am very curious about your results, @hunkatibor2. Is Sparkocam really necessary? Doesn't the live view of the 40D work directly in David? Letscan / image grabber is a very high resolution solution, but it is much slower then the live approach. I think it should be used for special projects but not replace the regular live view (Canon, HDMI capture card or industrial camera). Boah! I had a look at Christian Mendez' scans again and just realized which cheap hardware he used. Unbelievable! Isn't there someone on this forum who would do those modifications for me? Very quick test, I was just curious works of David SparkoCam, Canon. I'm afraid I'm too much a newbee to evaluate calibration panels. Do you have scanning results, too? Yes, I spend up steadily. My foot got caught in the USB cable to the camera and tore my plug. So I can not use digitization until it is corrected.